Today was a very special day. Right after first recess we noticed a pink present in our classroom. We all guessed at what it could be and we made a tally chart with our guesses. Eleven people guessed that it was an elf and they were...right! Next, we opened the box and found that we had a boy elf! 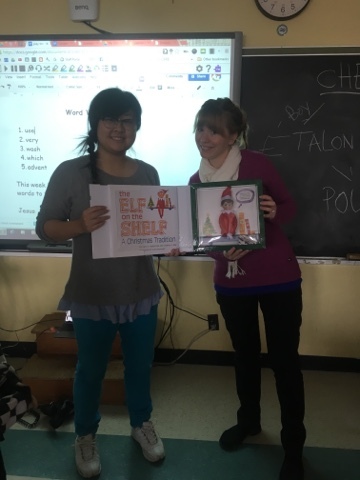 Miss.Amanda read us the story of the Elf on the Shelf. The book said that we needed to give our elf a name. We brainstormed our favourite names and voted. Finally, our elf had a name and it is...Foxy!